I'm lucky enough to have Jenny Ebert contributing to Something Old, Something New today. Great ideas are always welcome here! 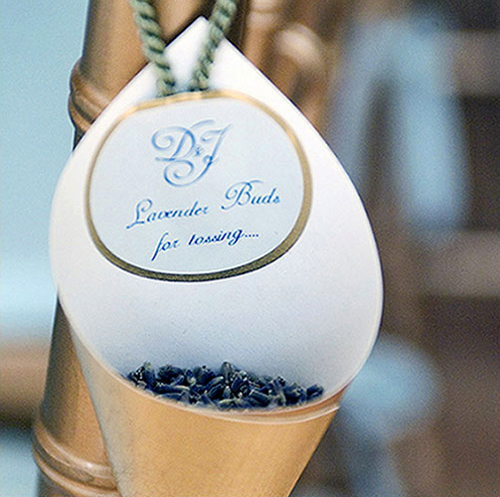 I love these little lavender cones created by Denise Vasaya (a wedding design consultant) for her own wedding. They not only looked fabulous but filled the entire room with a lovely scent. 2 standard size rolls gold leaf wall paper (Denise used hand-leafed custom wallpaper from one of her clients (Studio E NYC) retailing at a $72 per yard) Any sturdy paper can be used. 1. Cut 4” square into cones and secured them with glue. 2. Secured the cord in place with a label. I love this idea! The smell of lavender would be so soothing and nice at a wedding. What exactly do you do with the cones though? How would they be displayed/presented? I think she hung them on the backs of the chairs by the gold cording. The labels affixed to the inside of the cones doubled as the fastener for the cord. The loop fits on the chair corner nicely. You can also use ribbon and just tie it on. If you have nothing to to tie it to, put the lavender in tuille and tie it with ribbon. then you can rest the cones onguests seats. As a lavender fan, this lovely cone seduced me. It certainly looks very cute on this picture. Love the thought of using lavender but rose petals would also work here. You could hang them just on the aisle seats or have the flower girl hand them out as she walks down the aisle to be thrown later. I am definitely using this idea. I will be mixing the lavender and dried rose buds. let them read about cake!